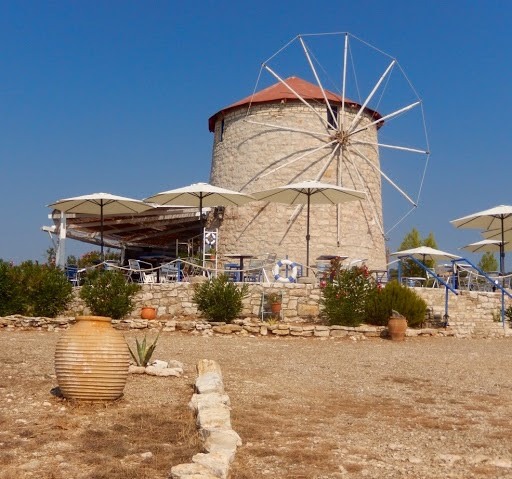 In Georgina’s third entry in her summer sailing in Greece diary, she and her husband continue island hopping from Lefkada to discover Mitikas, the Kalamos Islands and her personal favourite, Ithica. Get Georgina’s tips for anchoring, cooking on board and discovering the history and culture of Greece below to help you plan for your next boat holiday in Lefkada. After leaving the seaside town of Mitikas from the mainland, we have had another lovely week, although there was not much wind for sailing. We ended up mooring in a mixture of very quiet anchorings, and busy harbours. A mini heatwave in Greece has pushed up temperatures to 35-40 degrees so we have been swimming off the boat whenever we could. We anchored for two nights at Port Leone, a large bay, popular with cruisers on the SE trip of Kalamos islands. There are the remains of a ruined village here, including an old olive press, but an earthquake in 1953 destroyed their water supply and the village was abandoned. The lovely church has been restored and can be seen from some distance away. Two piers remain, and Tim (my husband) was able to moor Fandancer with her stern against one of the piers. Few boats try this manoeuvre, as the water looks too shallow, but we had no problems with our yacht draft of 1.4 m.
Close to Kalamos is the smaller island of Kastos, which only had one harbour for yachts. We chose to anchor on the other side of the harbour, close to shore, as it was much nicer for swimming off the boat, so we took two long stern lines ashore to avoid Fandancer from swinging. We met a lovely Italian family on a nearby boat and spoke to Fabio who owns a drome with a camera. He kindly offered to film us on Fandancer as we raised the anchor and left the harbour. I can’t wait to see the results! Also last week we sailed to Ithica, one of my favourite Greek islands. Again, as it was very hot, we chose to anchor overnight in the bay close to Pighadi on the south-east coast of Ithica. There were many yachts there when we arrived, but most of them left before nightfall. We had a lovely quiet evening aboard, and I cooked a tray of Greek vegetables in the oven on Fandancer, which we ate with chicken. I simply put some zucchini, potatoes, green beans and tomatoes in a tray with oregano and lots of olive oil, and let it cook in the oven for up to two hours. 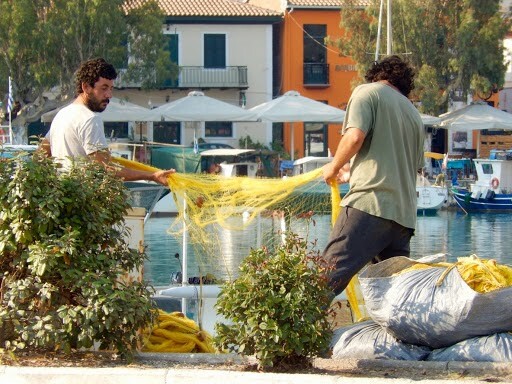 The Greeks call this ‘briam’ which you will often find on a taverna menu. The following day we motored to Kioni, also on Ithica, and a complete contrast to our previous quiet bay. 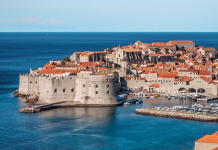 Kioni is a very popular, extremely busy harbour – the remains of three distinctive ruined windmills can be seen on your port side as you enter the bay. It is a very attractive location, and definitely worth a visit, but our advice is to arrive early, preferably before noon, if you want a place on the harbour itself. Otherwise, you may have to anchor on the opposite side with long lines ashore, and you will need to use your dinghy to leave the boat. 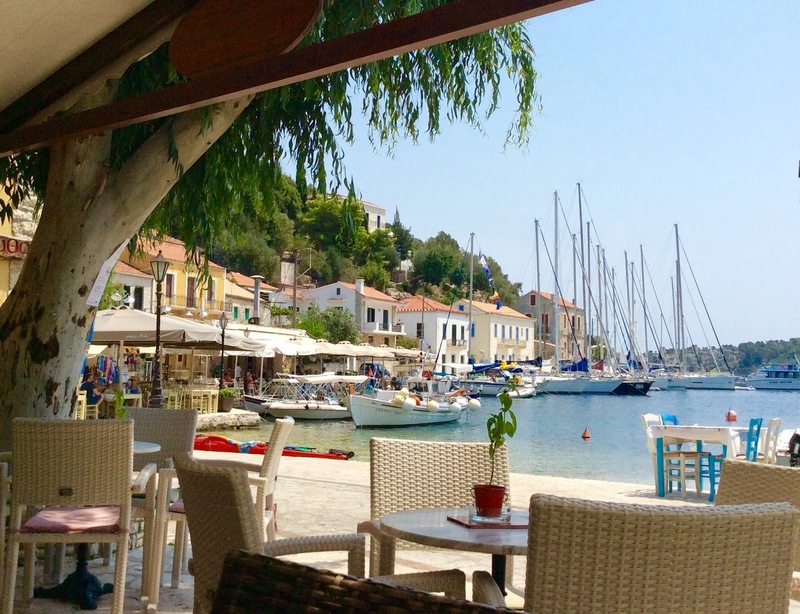 There are many pretty tavernas and cafes around the harbour, and it is fun to sit with a cold drink and watch the boats jostling for space. When you leave, be prepared for crossed anchors – this is almost inevitable when yachts are lying so close to each other. Leaving Ithica behind, we headed north to Lefkada, and had a breezy sail to Vassiliki, on the south-coast. Fandancer is a two-masted ketch, but we often only use the foresail and the mizzen, and not the mainsail. We still achieve a boat speed of over six knots, which is very good for a boat of her age and weight. Vassiliki is well-known as a major European water sports centre, as the afternoon breeze is steady and predictable. It is an amazing sight to see a dozen of brightly coloured windsurfers zipping back and forwards across the bay. A new inner harbour is being built at Vassiliki, which will make it much more sheltered for visiting yachts. Also, a new pedestrianised walkway from the town towards the water sports site is under construction, so there is some building work in progress. However, the town itself retains an authentic Greek charm and the harbour is surrounded by many cafes and tavernas, and there is a busy street with a variety of small shops. We particularly enjoyed a meal of fresh fish at Alexander’s taverna on the waterfront and chose ‘Gavros’ (small fried fish) and Greek salad for lunch. Next week we are going north, back through the Lefkas floating bridge, and into the North Ionian, heading for Paxos and then Corfu. Did you miss the first two diary posts from Georgina? You can read them, and the rest of Georgina’s inspiring posts in our magazine or just click here. 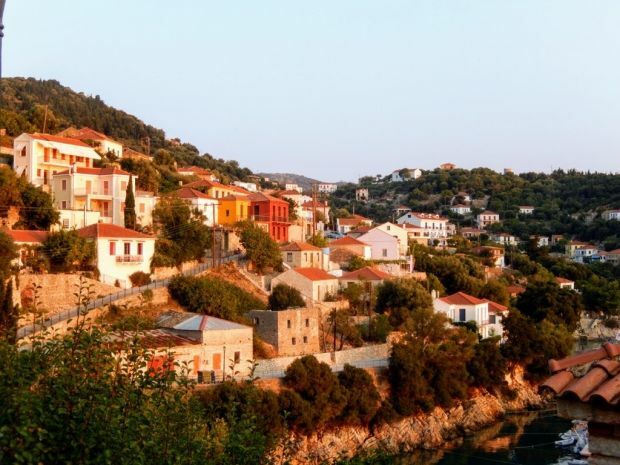 Are you also excited to discover Ithica, Georgina’s favourite island in Greece? We are more than happy to help you plan your next boat holiday there. Check out our fleet and plan your next trip to enjoy a holiday spent island hopping from Lefkada.